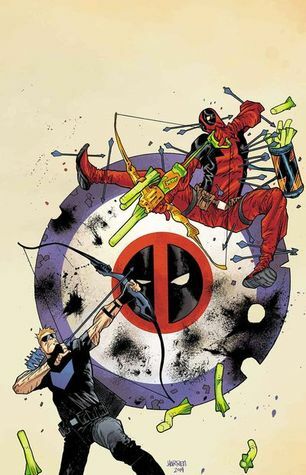 Hawkeye vs. Deadpool, the Unlikely Couple to Save the World – LILY & GENEROSO 4EVER! This week, when I traveled to my local comic book shop, I was thrilled to find the newest issue (#20) of Hawkeye. For me, Fraction and Aja’s take on Hawkeye was my entry point into the world of graphic novels and comic books, and it is a series that I perhaps hold a little too dearly to my heart. Sadly, my excitement faded when I found out that the issue was a Kate Bishop one rather than a Clint Barton one (especially after #19 which is almost entirely written with sign language). I’ll cut my criticisms short on the Kate component of the Hawkeye series and just say that the narrative for Kate’s story arc is lackluster and pallid compared to that of Clint’s. In light of my disappointment, a neighboring series caught my eye because I am now programmed to take a look at anything that has the name “Hawkeye” on it. Hawkeye vs. Deadpool is a new Marvel cross-pollination hero series, with issue zero released in September and issue one released in October. Superhero collaborations, be it two heroes or teams of heroes, are always a little dicey. Like greatest hits albums, which will often only include the most popular tracks and only show one side of an artist, superhero collaborations often lose the nuances and the intricacies of the characters involved and end up showing only a more polished version of the skeleton of the main subjects. However, the best thing that a summary/compilation album can do is introduce you to the fundamental core of an artist and encourage you to explore beyond. Similarly, collaboration/crossover narratives in comic books can do the same, and Hawkeye vs. Deadpool is one of those superhero combinations that facilitates the desire to dive deeper into the individual characters involved. 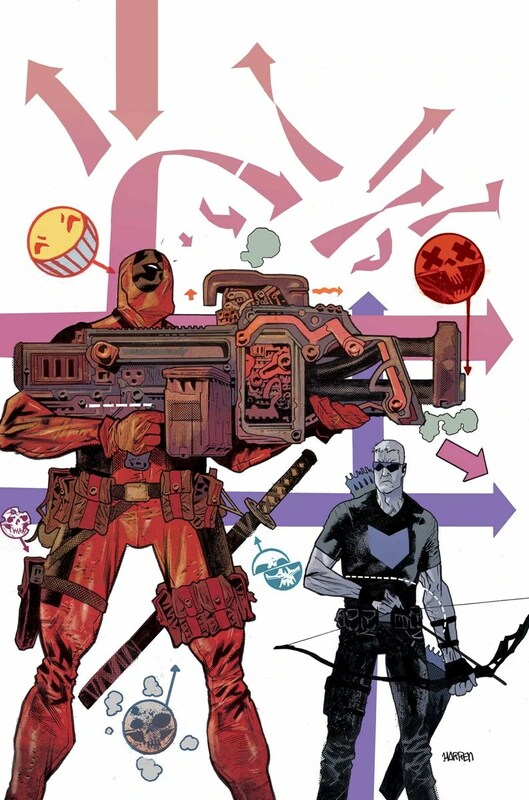 Hawkeye vs. Deadpool introduces us to Clint Barton’s and Deadpool’s vastly conflicting personalities and tactics as superheroes, with Clint as the semi-diplomatic and semi-reasonable member of society and Deadpool as the brash and semi-caustic mutant. Both have senses of humor that also acutely reflect their personas, making their interactions with each other the bright star of this series. The action part of the story focuses on the two trying to prevent a S.H.I.E.L.D. hacker from causing harm, but the real meat of Hawkeye vs. Deadpool lies in their uncanny working relationship; the two oddly have a similar relationship as Peter Falk and Alan Arkin in The In-Laws (1979), with Hawkeye resembling Sheldon, the mild-mannered dentist, and Deadpool resembling Vince, the impetuous businessman and possible CIA agent. Both pairs are in desperate situations and must rely on non-ideal partners to try and save the day. Consequently, in their bickering and in their comedic moments of miscommunication, Hawkeye and Deadpool, like Sheldon and Vince, become characters that you care for, cheer on, and want to learn more about. Don’t expect an insightful commentary on humanity through superhero metaphors from Hawkeye vs. Deadpool, but do get excited for its silliness and its pure entertainment and comedic value. Though not a masterpiece, Hawkeye vs. Deadpool achieves what it sets to accomplish: a fun integration of two unlikely heroes and personalities. In addition, I am not familiar with the new Deadpool series, and I am now motivated to read it, which makes Hawkeye vs. Deadpool all the more successful in its endeavor. Hawkeye vs. Deadpool issues #1 &2 are now available via Marvel comics. Generoso and His Triple Layer Italian Cream Birthday Cake!